Green Hill Farm Holiday Park in the New Forest is officially the best place to ‘go’ in Britain, according to judges of the annual Loo of the Year awards. The business was recently named as the overall 2016 Loo of the Year winner in the holiday parks category of the competition, beating more than 3,000 other UK parks to the title. The prestigious accolade was awarded to the family-run park after its washroom facilities were mystery shopped by inspectors. The spacious new washroom facilities at the park include large showers and drying areas, private vanity cubicles, a family bathroom, hairdryers, underfloor heating, and full access for people with limited mobility. According to Lorna, the washroom building simply mirrors what the park itself aspires to: “Green Hill has a very special appeal to people who enjoy away-from-it-all holidays in gorgeous surroundings, and we’ve tried to provide the perfect backdrop for that.” she said. Clean washroom facilities, like those at Green Hill Farm, are the bare minimum a guest will expect while on holiday. 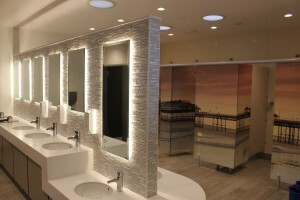 In an increasingly competitive market, it is more important than ever that holiday parks offer a certain level of comfort and luxury in terms of washroom provisions for their guests, to ensure a positive and lasting impression.